What does "Reserving Jurisdiction" mean in the context of family law? "If the court is unable to resolve the issue in the proceeding under the Family Code, the court may reserve jurisdiction over the particular issue until such time as the rights of such person and the parties to the proceeding under the Family Code have been determined in a separate action or proceeding." There are several reasons why a Court may want to reserve jurisdiction to address an issue at a later time or why a Marital Settlement Agreement may specifically state that there is a reservation of jurisdiction. 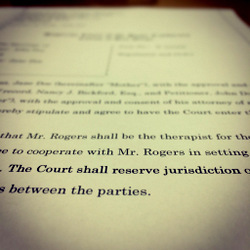 One reason is that although the parties may be in agreement pursuant to the Marital Settlement Agreement, one or both parties may not follow through with the terms, so by reserving jurisdiction the court has the authority to step in to resolve any future disputes. Another reason a Court may reserve jurisdiction is to postpone the divorce until a later time. For example, if a court issues an order that reserves jurisdiction over the termination of the marital status, then this means that the parties are still legally married because the court is simply postponing the divorce until a later time. In this example, it does not refer to any of the other issues a court may decide during a divorce such as property division, child custody and support. The court may still make decisions on other aspects of the divorce but the actual divorce would be postponed until a later date. In simple terms, to “reserve jurisdiction” is equivalent to keeping a “foot in the door”. In other words, the court has the power to decide the undetermined issue at a later time or to make changes to the order if the law and order allow such changes to be made. Thus, the phrase can be interpreted as more of an acknowledgment than anything else. Family law case proceedings are complicated. Don't settle for less when determining your rights. If you have any questions regarding the family court process please contact Nancy J. Bickford at (858)793-8884 to schedule a consultation. Attorney Nancy J Bickford, Esq. is the only divorce lawyer in Del Mar representing clients, who is actively licensed as a Certified Public Accountant (CPA), and is also a Certified Family Law Specialist (CFLS).